As a STATE OF EMERGENCY measure, the World Health Organization has passed an edict requiring all media computer input devices to be equipped with a panic button. T.V. 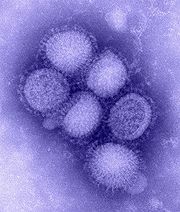 VIEWERS, RADIO LISTENERS, NEWSPAPER READERS, BILLBOARD OBSERVERS AND SKYPLANE WITNESSES HAVE REPORTEDLY BEEN INUNDATED WITH OVERBLOATED STORIES SPREADING PARANOIA ABOUT THE H1N1 SWINE-AVIAN-HUMAN MEXICAN WORLDWIDE INFLUENZA LEVEL 6 PANDEMIC!!! THIS HAS RESULTED IN PARANOIA THOUSANDS, NO, MILLIONS, OF TIMES MORE WIDESPREAD THAN THE FLU ITSELF!!!! PEOPLE ARE AFRAID OF DEATH! AFRAID OF DEATH! AFRAID OF DEATH!!!!!!!! The viruses are 100 NANOMETRES in diameter. to watch T.V. commercials, purchase newspapers, drive off the road, and strain their necks at the sky. No, this is beyond ordinary profit-seeking hype. This hype is meant to control your every move. DID YOU SCRUB YOUR HANDS FOR 375 SECONDS WITH ANTI-VIRAL SOAP, SANDPAPER, AND A RAZOR BLADE? DID YOU KNOW THAT WHEN YOU SHAKE HANDS WITH SOMEONE, YOU'RE SHAKING HANDS WITH EVERY PERSON THEY'VE EVER SHAKEN HANDS WITH?? EVER?!?!? HAVE YOU LINED UP FOR 18 AND A HALF HOURS IN A HAILSTORM TO GET THE VACCINE, ONLY TO FIND OUT THEY GAVE THE LAST ONE TO THE GUY IN FRONT OF YOU??? DID YOU SNEEZE ONLY INTO THE FRESH BAGGIE YOU GLUED TO YOUR SHIRT UNDER YOUR ARMPIT THIS MORNING?????? YOU DID GLUE A FRESH BAGGIE TO YOUR ARMPIT TODAY, DIDN'T YOU?? WHEN WAS THE LAST TIME YOU WORE A CONDOM? Scientists have been working around the clock to come up with an antidote to this problem, and they have finally found one: Turn off your T.V. set and radio, recycle your newspaper, drive with your eyes closed, and keep your head facing the ground. And turn off your computer, you infoaddict. No wonder you're so hyped. This page was last edited on 5 June 2012, at 06:01.